Vizocom is a leading IT and communications service provider and a provider of VSAT services in Middle East with special focus on Iraq, Libya and Afghanistan. They have local offices in Baghdad, Basra (Iraq), Kabul (Afghanistan) and Tripoli (Libya) which provide bi-lingual helpdesk support as well as onsite support to their clients. Vizocom is providing services for hundreds of sites spread all over Iraq and Afghanistan including many of major Oil companies in southern Iraq. The service availability has been better than 99.7%. Dedicated service is offered using Janux Mark II and Comtech on Eutelsat W7 high power Ku band spot beam centred on the Middle East area. The elevation angle is high up around 45 degrees, well clear of the problems that occur at 10 deg or below with rain fade and scintillation in warm humid weather. Vizocom�s main teleport is at Nittedal in Norway, one of the largest in Europe, where there are two 155 Mbit/s connection into the terrestrial internet backbone. Your customer VSAT terminal will be 1.8 to 2.4m diameter depending on location in the beam contours. Bit rates available range from 64kbit/s to 20 Mbit/s in the up direction and 64 kbit/s to 154 Mbit/s in the download direction. In addition to Janux dedicated services, Vizocom also provides shared and TDMA dedicated services based on iDirect Evolution technology. 1.2m dishes can be used for up to 4Mbps downlink and 512kbps uplinks. For higher uplink bandwidths, 1.8m dish should be used. Bandwidth options are available with contention ratios of 1:1, 1:2, 1:4, 1:8 and 1:20 as well as other customized rates for larger projects. All services come with full CIR and QOS prioritization for video and VOIP to guarantee the service reliability. 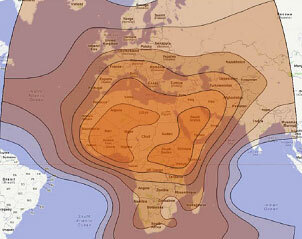 In addition to Ku-Band services, Vizocom also provides satellite services on iDirect technology on C-band. These services are provided on Arabsat 5C satellite. In addition to VSAT services, Vizocom supports their clients with providing turnkey IT and communication services with full local support. These services include VOIP, Video Conferencing, LAN and WLAN infrastructure, supply of computer and office equipment. 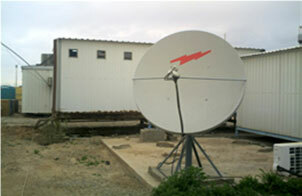 Nittedal satellite internet hub teleport dishes. Dedicated service on W7 Ku band spot beam. Customer VSAT equipment 1.2m diameter antenna. C-band services are provided ArabSat 5c. The information on this page is my write up about the service. The pictures are reproduced with permission of Vizocom. This is not a paid for advertisement. Page started 8 Oct 2012, updated: 4 Feb 2018, HTML5 26 April 2018.